Identification: Free-floating perennial monocot with thick, glossy leaves (12-15 cm wide) that are obovate to lanceolate. Leaves are held above the water by bulbous, spongy inflated petioles (to 30 cm long) when plants grow in relatively open conditions. Petioles are thinner and more vertical when growing under crowded conditions (Center and Spencer 1981; Gettys 2014; Penfound and Earle 1948). Generally, 6-8 leaves per plant. Rosette leaf arrangement from central growing point (monopodial) with older leaves in an increasing horizontal orientation (Center and Spencer 1981). Roots are pendant, typically dark in color and feathery. Showy lavender flower spikes (sometimes pale blue to white) bloom summer to early fall and are insect pollinated; individual flowers are 4-6 cm wide and have six lobes with the upper lobe enlarged and a central yellow spot surrounded by dark blue. Pollinated flowers produce capsules containing many seeds (Barrett 1980). Multiple ramets, or daughter plants, form on an horizontal stolon from axillary buds. Size: Up to 1 m in height. Table 1. States with nonindigenous occurrences, the earliest and latest observations in each state, and the tally and names of HUCs with observations†. Names and dates are hyperlinked to their relevant specimen records. The list of references for all nonindigenous occurrences of Eichhornia crassipes are found here. Ecology: Eichhornia crassipes is a fast growing, troublesome aquatic plant with global distributions in tropical and subtropical areas of the world (Center and Spencer 1981; Penfound and Earle 1948). The showy, attractive lavender flowers precipitated this worldwide distribution. Once introduced to a new region, the plant quickly establishes and spreads. In the absence of sustained freeze, the plant grows as a perennial. In its northern range, the plant grows as an annual, where it is either re-introduced or germinates from seed. Long-term exposures (2-4 weeks) to temperatures at or near freezing are required to significantly reduce E. crassipes populations (Owens and Madsen 1995; Russell 1942). The plant has a low tolerance for saline waters. Plants grown in water containing 3% seawater exhibited significant leaf necrosis after 28 days (Penfound and Earle 1948). Dense, floating mats of E. crassipes and the subsequent build-up of organic detritus in the mat create an environment that supports the growth of emergent aquatic and terrestrial species, including woody species such as Salix spp. and Cephalanthus occidentalis. These floating islands (also referred to as tussocks, sudds, and flotants), accelerate succession and create concern for navigation and infrastructure (Penfound and Earle 1948; Russell 1942). Eichhornia crassipes reproduces vegetatively through the production of ramets and an abundance of seeds. Flowers are known to be pollinated by a number of insects, most notably the introduced honey bee (Aphis mellifera L.) (Penfound and Earle 1948; S.C.H. Barrett). Seeds remain dormant in the hydrosoil until exposed to a drying event (Penfound and Earle 1948; Gettys 2014). Eichhornia crassipes can double its population in as little as two 2 weeks, creating an enormous amount of floating biomass (Penfound and Earle 1948). One hectare of healthy E. crassipes can weigh as much as 415 metric tons (Schardt 1997). Means of Introduction: Sold as an ornamental for fish ponds; sometimes escapes or is intentionally introduced into larger water bodies such as lakes and reservoirs. Status: Populations in the southeastern (North Carolina to Texas) and southwestern (California and Arizona) US remain established (including Guam, Hawaii, Puerto Rico, and the Virgin Islands), while those in northern states (Washington to Colorado to New York) likely do not overwinter. Impact of Introduction: Since its introduction, E. crassipes has notoriously interfered with navigation, triggering the 55th Congress, through the Rivers and Harbors Act of 1899, to authorize the U.S. Army Corps of Engineers to address the problem (Schardt 1997) after commercial commerce was impeded by E. crassipes on the St. Johns River (Webber 1897). In one instance, 65 feet of a railroad trussel across Rice Creek near Palatka, FL was destroyed in 1894 by build-up of waterhyacinth. Eichhornia crassipes can develop into dense floating mats of substantial biomass, intertwined with stoloniferous offshoots, and often associated with the growth of opportunistic emergent macrophytes, resulting in this introduced plant being labeled one of the “world’s worst weeds” (Holm et al. 1997; Lowe et al. 2000). The free-floating nature of the plant only exacerbates its problematic standing because the populations can move with water flow and wind. Recreational use of waters infested with this plant are greatly reduced. Eichhornia crassipes can also impede drainage, creating backwater flooding conditions. Water quality and wildlife habitat can be greatly affected, reducing dissolved oxygen levels under mats by an order of magnitude and covering the water surface with an impenetrable barrier (Penfound and Earle 1948). These dense surface mats shade out desirable submersed aquatic plants and create a safe breeding environment for mosquitoes (Savage et al. 1990). Acevedo-Rodríguez, P., and M.T. Strong. 2005. Monocotyledons and gymnosperms of Puerto Rico and the Virgin Islands. Contributions from the United States National Herbarium, volume 52. Smithsonian Institution, Washington, DC. http://www.nmnh.si.edu/botany/pubs/CUSNH/vol52web.pdf (accessed on April 30, 2007). Adam, M.D., M.C. Colwell, J. Marencik, and M.A. Pfister. 2001. 2000 Summary report of Grandwood Park Lake - Lake County, Illinois. Lake Co Health Department Environmenal Health Services Lakes Management Unit, Waukegan, IL. http://www.co.lake.il.us/health/pdfs/ehs/lakereports/grndwood.pdf. Adam, M., C.L. Brant, M. Colwell, J. Marencik, and M. Pfister. 2004. 2003 Summary report of Flint Lake - Lake County, Illinois. Lake Co Health Department Environmenal Health Services Lakes Management Unit, Waukegan, IL. http://www.co.lake.il.us/health/pdfs/ehs/lakereports/FlintLake.pdf. Alix, M.S., and R.W. Scribailo. 2010. The herbaceous lacustrine macrophytes of Indiana, United States of America. Check List 6(2):255-267. Allen, D. and C. Thomasan. 2012. Recreational Fisheries of the ACE Basin. http://www.nerrs.noaa.gov/doc/siteprofile/acebasin/html/resource/recfish/rffrshwt.htm. Accessed on 12/14/2012. Antillean group of Invasive Species (GAEI). 2015. Atlas de Especies Invasoras de Puerto Rico. University of Puerto Rico Agricultural Sciences, Mayagüez, PR. http://atlas.eea.uprm.edu/. Accessed on 08/10/2015. Aquatic Resources Education Center. 1995. List of Aquatic Plants found in Delaware Ponds 1973-1995. Division of Fish and Wildlife, Department of Natural Resources and Environmental Control, Smyrna, DE. Aurand, D. 1982. Nuisance Aquatic Plants and Aquatic Plant Management Programs in the United States. Volume 2, Southeast. The MITRE Corporation, McLean, VA.
Barrett, S.C.H. 1980. Sexual reproduction in Eichhornia crassipes (water hyacinth). II. Seed production in natural populations. Journal of Applied Ecology. 17:113-124. Bartodziej, W., and J. Ludlow. 1997. Aquatic vegetation monitoring by natural resources agencies in the United States. Journal of Lake and Reservoir Management 13(2):109-117. Batte, J. 2015. Agencies prepare for invasive water plant. Daily Comet. Thibodaux, LA. http://www.dailycomet.com/article/20150620/ARTICLES/150629981?Title=Agencies-prepare-for-invasive-water-plant. Created on 06/21/2015. Accessed on 01/12/2016. Beal, E.O. 1977. A Manual of Marsh and Aquatic Vascular Plants of North Carolina with Habitat Data. The North Carolina Agricultural Experiment Station, Raleigh, NC. Beal, E.O., and J.W. Thieret. 1986. Aquatic and Wetland Plants of Kentucky. Kentucky State Nature Preserves Commission, Frankfort, KY.
Beaton, L., and M. Murphy-Hoffman. 2015. Beauty wasn't so beautiful. Putnam County Historical Society. Palatka, FL. Spring. 6 pp. http://www.putnam-fl-historical-society.org/SocietyNewsLetters/PCHS%20Spring,%202015%20Newsletter.pdf. Beck, P.A., and R.A. Ott. 2006. Statewide freshwater fisheries monitoring and management program survey report for Lake Palestine, 2005. Texas Parks and Wildlife Department, Federal Aid Report F-30-R-31 Tyler, TX. http://www.tpwd.state.tx.us/publications/pwdpubs/media/lake_survey/pwd_rp_t3200_1353_2005.pdf (accessed 12 February 2008). Bogart, D.B. 1949. The effect of aquatic weeds on flow in Everglades canals. Proceedings of the Soil Science Society of Florida 9:32-52. Brown, E.T., and R. Athey. 1992. Vascular Plants of Kentucky an Annotated Checklist. University Press of Kentucky. Brown, L.E., G. Nesom, S.J. Marcus, and D. Rosen. 2009. Plants of Trinity River National Wildlife Refuge. Trinity River NWR, US Fish and Wildlife Services, Liberty, TX. http://www.fws.gov/uploadedFiles/TRNWRPlants_2009.pdf. Bryson, C.T., and D.A. Skojac, Jr. 2011. An annotated checklist of the vascular flora of Washington County, Mississippi. Journal of Botanical Research Institute of Texas 5(2):855-866. Calflora. 2015. Berkeley, California: The Calflora Database. http://www.calflora.org/. Accessed on 12/04/2015. Center, T.D. and N.R. Spencer. 1981. The phenology and growth of water hyacinth (Eichhornia crassipes (Mart.) Solms) in a eutrophic North-central Florida lake. Aquatic Botany 10:1-32. Center for Environmental Studies. 2015. SEINet - Southwest Environmental Information Network. Symbiota Software Project, Arizona State University, Phoenix, AZ. http://swbiodiversity.org/seinet/index.php. Accessed on 01/11/2016. Chester, E.W., B.E. Wofford, R. Kral, H.R. DeSelm, A.M. Evans. 1993. Atlas of Tennessee Vascular Plants Volume 1. Pteridophytes, Gymnosperms, Angiosperms: Monocots. Volume 1. Center for Field Biology, Austin University, Clarksville, TN. Cohen, A.N., and J.T. Carlton. 1995. Nonindigenous Aquatic Species in a United States Estuary, A Case Study of the Biological Invasions of the San Francisco Bay and Delta. A report for the United States Fish and Wildlife Service, Washington, DC and The National Sea Grant College Program Connecticut Sea Grant. http://nsgl.gso.uri.edu/conn/connt95002/connt95002full.pdf. Colorado Weed Management Association. 2008. Weed Spotter. http://www.cwma.org/weedspotter.html. Connecticut Agricultural Experiment Station. 2008. CAES Individual Lake Results. http://www.ct.gov/caes/cwp/view.asp?a=2799&q=377004&caesNav=|. Accessed on 06/23/2008. Conner, W., C. Sasser, and N. Barker. 1986. Floristics of the Barataria Basin Wetlands, Louisiana. Castanea 51(2):111-128. Consortium of northeastern herberia (CNH). 2015. Symbiota Software Project. http://portal.neherbaria.org/portal/. Accessed on 07/18/2015. Crouch, V.E., and M.S. Golden. 1997. Floristics of a bottomland forest and adjacent uplands near the Tombigbee River, Choctaw County, Alabama. Castanea 62(4):219-238. EDDMapS. 2015. Early detection and distribution mapping system. The University of Georgia - Center for Invasive Species and Ecosystem Health. Fassett, N.C. 1957. A Manual of Aquatic Plants. The University of Wisconsin Press, Madison, WI. Fosberg, F.R. 1976. Revisions in the flora of St. Croix U.S. Virgin Islands. Rhodora 78:79-119. Fox, A., and A. Wigginton. 1996. Please help us find Aquatic Soda Apple. Aquatics 18(1):10-13. Freeman, C.C. 2000. Vascular plants new to three states in the central United States. Transactions of the Kansas Academy of Science 103(1/2):51-54. http://www.jstor.org/stable/3627937. GBIF. 2013. Global Biodiversity Information Facility (GBIF) Database. Global Biodiversity Information Facility. http://www.gbif.org/. Accessed on 05/01/2013. Gettys, L.A. 2014. Waterhyacinth: Florida's worst floating weed. UF/IFAS Extension. SS-AGR-380. Gettys, L. 2015. Aquatics. Florida Aquatic Plant Management Society. Orlando, FL. 37 (3/4):12-16. Gibbons, J. 2011. The Connecticut Agricultural Extension Stattion Aquatic Plant Survey Program. http://ct.gov/caes/cwp/view.asp?a=2799&q=376972&caesNav=|. Hannick, V.C., J.N. Mink, J.R. Singhurst, and W.C. Holmes. 2013. Annotated checklist of the vascular flora of McLennan County, Texas. Phytoneuron 29:1-37. Hartman, R.L., and B.E. Nelson. 2001. A checklist of the vascular plants of Colorado. Rocky Mountain Herbarium, University of Wyoming, Laramie, WY. Harvard University Herbaria. 2007. Harvard University Herbaria. Harvard University, Cambridge, MA. http://www.gbif.org/dataset/861e6afe-f762-11e1-a439-00145eb45e9a. Created on 07/09/2007. Accessed on 11/20/2015. Harvill, A.M., C.E. Stevens, and D.M.E. Ware. 1977. Atlas of the Virginia flora, Part I. Pteridophytes through monocotyledons. Virginia Botanical Associates, Farmville. Helton, R.J., and L.H. Hartmann. 1996. Statewide Aquatic Vegetation Survey Summary, 1995 Report. Inland Fisheries Division, District 3-E, Jasper, Texas. Hess, T., R. Paille, R. Moertle, and K. Guidry. 1989. Results of an intensive marsh management program at Littel Pecan Wildlife Management Area. US Fishand Wildlife Service and Louisiana Dept of Natural Resources. Holm, L., J. Doll, E. Holm, J.V. Pancho, and J.P. Herberger. 1997. World weeds: natural histories and distribution. New York: John Wiley. iDigBio. 2015. Integrated Digitized Biocollections (iDigBio). National Resource for Advancing Digitization of Biodiversity Collections (ADBC), Gainesville, FL. https://www.idigbio.org/. Accessed on 07/16/2015. iMapInvasives. 2012. iMapInvasives Oregon. The Nature Conservancy. http://www.imapinvasives.org/. Accessed on 04/09/2015. iMapInvasives. 2015. iMapInvasives New York. iMapInvasives. www.nyimapinvasives.org. Created on 07/08/2015. Accessed on 07/08/2015. Johnson, E. 1920. Fresno County will fight water hyacinth. Califonia Agricultural Bulletin(9):202-203. Johnson, N.O. 2008. State gets tough to protect Caddo, other waterways. The Longview News-Journal, Longview, TX. 2008 (April 9). http://www.news-journal.com/news/content/news/stories/2008/04/09/04092008_lake_vegetation.html (accessed on 14 April 2008). Jones, S.B., Jr. 1974. Mississippi Flora. I. Monocotyledon families with aquatic or wetland species. Gulf Research Reports 4(3):357-379. Klorer, J. 1909. The water hyacinth problem. Journal of the Association of Engineering Societies 42(1):42-48. Lemke, D.E. 1989. Aquatic macrophytes of the Upper San Marcos River, Hays Co., Tesas. Southwestern Naturalist 34(2):289-291. Lowe, E.N. 1921. Plants of Mississippi. Mississippi State Geological Survey Bulletin No. 17. Hederman Bros, Jackson, MS.
Lowe, S., M. Browne, S. Boudjelas, and M. De Poorter. 2000. 100 of the world’s worst invasive alien species database. The Invasive Species Survival Commission of the World Conservation Union. Global Invasive Species Database. 12pp. Loyola University Chicago. 2013. Illinois Database of Aquatic Non-native Species. GISIN, Fort Collins, CO. http://gisin.org/cwis438/websites/GISINDirectory/Occurrence_Result.php?ProjectID=391&WebSiteID=4. Created on 05/13/2015. Accessed on 05/13/2015. Lynch, J.J., J.E. King, T.K. Chamberlain, and A.L. Smith, Jr. 1950. Effects of aquatic weed infestations on the fish and wildlife of the Gulf states. US Dept of the Interior, Fish and Wildlife Service Special Scientific Report No 39. Madsen J.D. 2010. Invasive Plant Atlas of the MidSouth. Geosystems Research Institute, Mississippi State University, Starkville, MS. http://www.gri.msstate.edu/ipams/. Marks, K. 2006. Botanists aiming to root out hyacinth. Northwest Arkansas' News Source, Northwest Arkansas. 2006 (September 14). http://www.nwanews.com/adg/News/165671/ (accessed on Oct. 17, 2006). Martin, C.C. 1999. Invasive species grant proposal, survey of aquatic vegetation in Delaware's public ponds. Department of Natural Resources & Environmental Control, Division of Fish & Wildlife, Smyrna, DE. Maurin, G. 2016. LaPlace Town Talk: Pesky plant invades Belle Terre golf club's ponds. The Times-Picayune. New Orleans, LA. http://blog.nola.com/river/2016/01/the_pond_doctor_called_in_to_c.html. Created on 01/20/2016. Accessed on 01/21/2016. Mehrhoff, L. 1996. Hawaiian flowering plants checklist. The State Museum of Natural and Cultural History, Honolulu, HI. http://wwwbishophawaiiorg. Created on 03/12/1996. Michigan State University. 2015. Midwest Invasive Species Information Network (MISIN). Michigan State University, East Lansing, MI. http://www.misin.msu.edu/browse/. Accessed on 12/04/2015. Missouri Botanical Garden. 2015. Tropicos.org. Missouri Botanical Garden, St. Louis, MO. http://www.tropicos.org. Accessed on 07/16/2015. Moody, H.L. 1973. Some values of Florida's aquatic weeds. The Florida Naturalist(Apr):7-12. Myers, R.L., and J.J. Ewel. 1990. Ecosystems of Florida. University of Central Florida Press. New York Botanical Garden. 2015. The New York Botanical Garden Herbarium (NY) - Vascular Plant Collection. The New York Botanical Garden, New York, NY. http://www.gbif.org/dataset/d415c253-4d61-4459-9d25-4015b9084fb0. Created on 06/18/2015. Accessed on 11/20/2015. Newman, M.J., and W.W. Thomaston. 1979. Aquatic weed control in Georgia. Proceedings of the Southern Weed Science Society 32:271-279. O'Keefe, T. 1976. Hyacinth War. The Florida Naturalist(Aug):10-14. Padgett, D.J. 2001. Noteworthy Collections and Spread of Exotic Aquatics in Missouri. Castanea 66(3):303-306. Parsons, J. 2005. Annual Washington State Aquatic Plant Survey Database. Washington Department of Ecology . http://www.ecy.wa.gov/programs/eap/lakes/aquaticplants/index.html#annualsurvey. Penfound, W.T., and T.T. Earle. 1948. The biology of water hyacinth. Ecological Monographs 18(4):447-472. Perfetti, P.B. 1983. 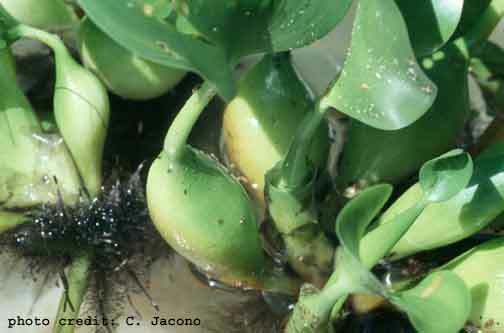 Use of insects and pathogens for management of water hyacinth in Louisiana. U.S. Army Corps of Engineers Aquatic Plant Control Research Program Information Exchange Bulletin A-83-1. U.S. Army Corps of Engineers Waterways Experiment Station, Vicksburg, MS.
Perkins, B.D. 1974. Arthropods that stress waterhyacinth. PANS 20(3):304-314. Poppleton, J.E., A.G. Shuey, and H.C. Sweet. 1977. Vegetation of central Florida's east coast; a checklist of the vascular plants. Florida Scientist 40(4):362-389. Radford, A.E., H.E. Ahles, and C.R. Bell. 1968. Manual of the Vascular Flora of the Carolinas. Univ. North Carolina Press, Chapel Hill. Radford, A.E., H.E. Ahles, C.R. Bell, D.E. Rayner, C.A. Smith, and J. Townsend. 1997. South Carolina Plant Atlas. http://cricket.biol.sc.edu/herb/. Regents of the University of California. 2015. Jepsen online interchange for California floristics. University and Jepson Herbaria, University of California, Berkeley. http://ucjeps.berkeley.edu/interchange.html. Robles, W., J.D. Madsen, and R.M. Wersal. 2015. Estimating the biomass of waterhyacinth (Eichhornia crassipes) using the Normalized Difference Vegetation Index derived from simulated Landsat 5 TM. Invasive Plant Science and Management 8:203-211. Roe, G. 2015. New invasive species found in La Crosse pond. News 19 WXOW.com. La Crosse, WI. http://www.wxow.com/story/30029104/2015/09/14/new-invasive-species-found-in-la-crosse-pond. Created on 09/14/2015. Accessed on 09/15/2015. Russell, R.J. 1942. Flotant. Geographical Review. 32:74-98. Sanderson, L. (ed.). 1996. Gulfwatch. National Association of Conservation Districts. League City, TX. 7 (3):2. Savage, H.M., E. Rejmankova, J.I. Arredondo-Jiménez, D.R. Roberts, and M.H. Rodriguez. 1990. Limnological and botanical characterization of larval habitats for two primary malarial vectors, Anopheles albimanus and Anopheles pseudopunctipennis, in coastal areas of Chiapas State, Mexico. Journal of the American Mosquito Control Association 6(4):612-620. Schardt, J. 1995. Nonindigenous aquatic weeds: a national problem. Aquatic Nuisance Species Digest. 1 (1):2-3. Schardt, J.D. 1997. Maintenance control. Pages 229-243 in D. Simberloff, D. Schmitz, and T.C. Brown, (eds). Strangers in paradise, impact and management of nonindigenous species in Florida. Island Press, Washington, DC. Seng, P., and G. White. 2003. Indiana aquatic nuisance species (ANS) management plan. Indiana Dept. of Natural Resources. Skojac, Jr., D.A., C.T. Bryson, and C.H. Walker, II. 2007. Noteworthy collections from the Yazoo-Mississippi delta region of Mississippi. Journal of Botanical Research Institute of Texas 1(1):769-775. Smith, E. 1988. An Atlas and Annotated List of the Vascular Plants of Arkansas. University of Arkansas. www.csdl.tamu.edu/FLORA/arkansas. Smith, L. 1978. Development of the emergent vegetation in a tropical marsh (Kawainui, I'ohu). Newsletter of the Hawaiian Botanical Society 17(1/2):2-27. Smithsonian National Museum of Natural History. 2015. Botany Collections. Smithsonian Institution, Washington, DC. http://collections.nmnh.si.edu/search/botany/. Accessed on 07/09/2015. South Carolina Department of Natural Resources. 2007. South Carolina Aquatic Plant Management Plan. South Carolina Department of Natural Resources, Columbia, SC. http://www.dnr.sc.gov/water/envaff/aquatic/plan.html. Thomas, R.D., and C.M. Allen. 1993. Atlas of the Vascular Flora of Louisiana. Vol I: Ferns and Fern Allies, Conifers, and Monocotyledons. Volume 1. Moran Colorgraphic Printing, Baton Rouge, LA. Texas Invasive Plant and Pest Council. 2015. Texas Invasives Database. http://www.texasinvasives.org/. Accessed on 11/20/2015. Toft, J.D., J.R. Cordell, and W.C. Fields. 2002. New records of crustaceans (Amphipoda, Isopoda) in the Sacramento/San Joaquin Delta, California, and application of criteria for introduced species. Journal of Crustacean Biology 22(1):190-200. University of Florida Herbarium. 2016. Florida Museum of Natural History. University of Florida, Gainesville, FL. http://www.flmnh.ufl.edu/herbarium/. Valentine, J.M. 1976. Plant succession after saw-grass mortality in southwestern Louisiana. Proceedings of the 13th Annual Conference. SE Assoc. Fish and Wildlife Agencies, 24-27 October 1976, Jackson, MS:634-640. Webber, H.J. 1897. The water hyacinth, and its relation to navigation in Florida. Volume Bulletin No. 18. Division of Botany, U.S. Department of Agriculture, Washington, D.C.
Wunderlin, R.P., B.F. Hansen, and E.L. Bridges. 1995. Atlas of Florida Vascular Plants. http://www.usf.edu. Yatskievych, G. 1999. Steyermark's Flora of Missouri, Vol 1. The Missouri Dept of Conservation, Jefferson City, MO in cooperation with the Missouri Botanical Garden Press, St Louis, MO.